Our fundraising team and volunteers are at local stores and supermarkets most weekends to pack shoppers’ bags and raise money through checkout collections. We also carry out regular bucket collections at major events. In the last year, we have been present at the fantastic Hydro arena in Glasgow on the nights of concerts by U2 and The Libertines and gigs by comedy star Kevin Bridges. Over the course of the year, these activities contribute enough funds to keep the Hospice running for two weeks. 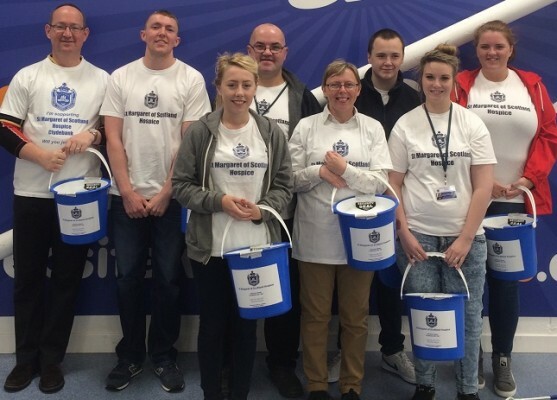 If you would like to help, please contact our fundraising department on 0141 435 7018. We’d love to hear from you! For information about other volunteering opportunities, please click here.